Five organizations were honored April 13 at Samford University’s inaugural Student Organization Awards. The event was coordinated by the Office of Student Involvement and Leadership. A total of 13 organizations from the more than 100 on campus were nominated for the awards. The winners were selected by a 10-member committee of students and employees from across the university. Air Force ROTC received the Outstanding Undergraduate Student Organization. It was recognized for hosting several events open to anyone on campus, and for its involvement and service during Freshman Move-in Day, Homecoming, Family Weekend and other events. It also provided education and awareness for veterans on campus. 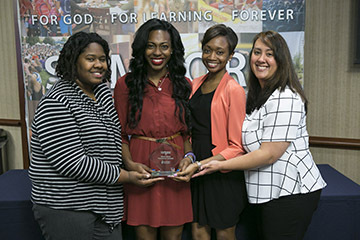 The Latino Student Organization was recognized as the Outstanding New Student Organization. Founded in 2014, it has promoted understanding and community through creative programming and regular collaboration with different organizations and departments on campus. The group also has been actively involved in the Birmingham community and has “truly filled a void that previously existed on our campus,” the selection committee said. Jordan Thompson, a second-year student in Samford’s Cumberland School of Law, was named Outstanding Student Organization Leader. Thompson has been actively involved in organizing and leading the new Campus Veterans Association in the last year. The committee noted that “in just a short time, this organization has contribution immensely to making Samford a more inviting and comfortable place” for student veterans and attributed that to Thompson’s leadership. The Outstanding Student Organization Adviser was Charles “Chuck” Stokes, assistant professor of sociology and faculty adviser to the Catholic Student Association. The selection committee noted that Stokes helped with logistics for the organization, and serves as a mentor and guide for the student members. Other groups that were nominated for various awards included American Pharmacists Association — Academy of Student Pharmacists, Delight Ministries, Film Club, Public Relations Student Society of America, Samford Crew Club, Samford Women’s Ultimate Club, Sustaining a Village Everyday, and You’re Not Alone. R. Phil Kimrey, vice president for student affairs and enrollment management, stressed the importance of diverse student organizations on a campus such as Samford’s.